I’ve written before about preventing plagiarism, but it’s definitely a topic that needs to be continuously explored. I was on a volunteer board in college where a student had been accused of plagiarism and was contesting the fact that it would go on their record. Here are some facts about the case, which was anonymous – I never found out who the student was. The student had plagiarized by not properly citing his sources. The whole paper was basically poorly paraphrased from other sources. Last week I talked about my resolve to pay off my student loans as quickly as possible. I don’t want to be paying over $800 a month for the next 14 years just to pay off my education. I want to be able to save money and travel and that’s just not very realistic with all that money coming out. Luckily, if I pay it off in bigger chunks, I’ll save a lot of money on interest. But before I get into that, I want to go into how I got into debt in the first place. I’ve never had credit cards. I’ve never overdrawn a bank account. All my debt is student loans (with the exception of a line of credit for car repairs that I’m on track to pay off before interest kicks in). I went to a small private school in Portland, Oregon. I’m from Idaho, so there was no in-state tuition, but that wouldn’t have applied since the school was private. I graduated four years and had the time of my life. I loved the small classes, the professors who kept me accountable, and the relatively small student body. I chose private school because I didn’t want to fall through the cracks. From a financial standpoint, it’s smarter to go to an in-state public school. If there is one that has the program you want, I would recommend forcing yourself to have the self-control to keep yourself accountable and not fall through the cracks. That being said, there’s more to life than money. I don’t know if I would have graduated if I’d gone to a large school, and then any money I had spent, though significantly less, would have been wasted. I also loved going away from home, and having experiences I never would have had otherwise. So, if you’re set on a small school, or an out-of-state school because you think you’ll enjoy it more, go for it. Just be smart about your finances. I got some scholarships, but mostly just the ones I qualified automatically for. I kept procrastinating on external scholarships until the deadlines were past. I also didn’t pay off any of the interest that accumulated while I was in school. This is a couple thousand that is now gaining interest, that I could have paid off while still in school. If I had been making payments while in school, I would have had more of a mind about my finances and probably would have saved a lot more. The main point of all this is that going into debt is easy. And getting out takes a lot of time and effort. So even if you don’t have to make payments for a while, make them anyway. Think about the payments you’ll have to make in the future. Yes, go out and have fun. I wouldn’t trade my college experience for the world. But I still would have loved it if I had eaten out a couple fewer times a month, and been more financially conscious. 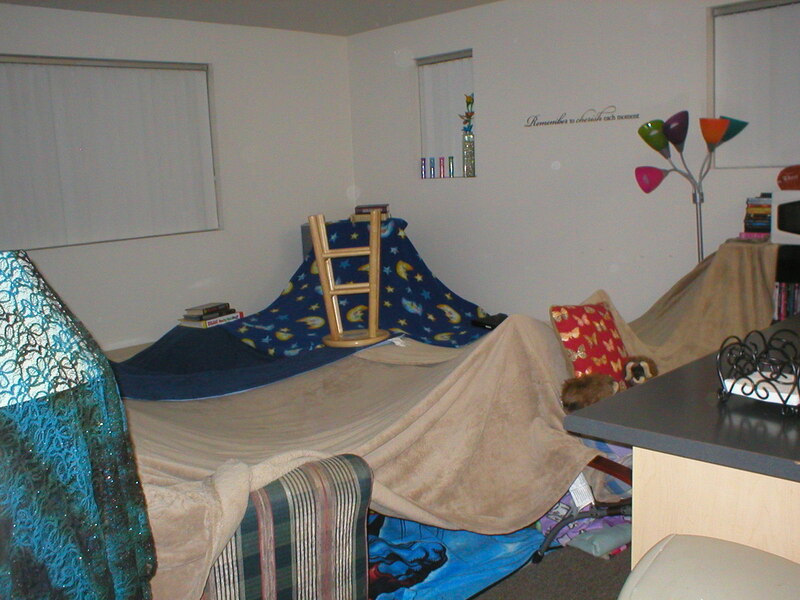 I can’t believe I wrote a post about special places and tree forts yesterday and didn’t talk about blanket forts. 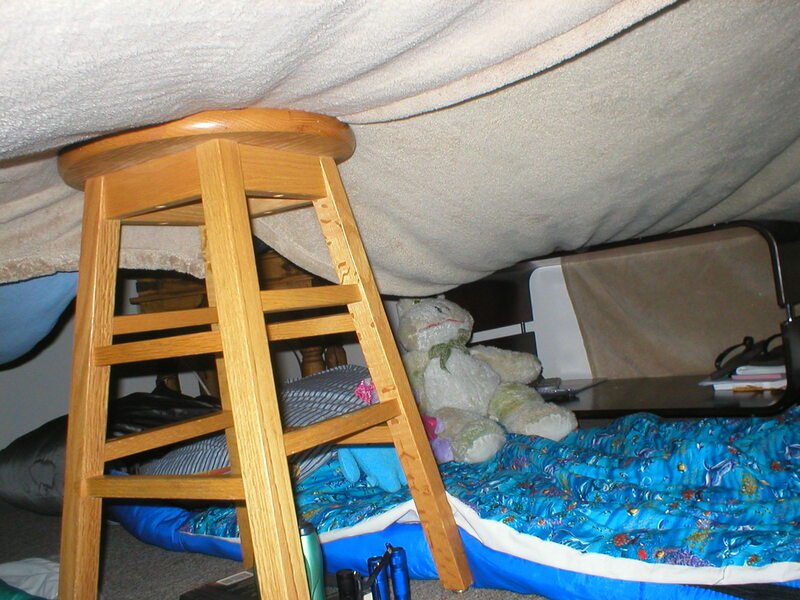 I don’t think I really built blanket forts as a kid. Mom would not have been happy at us destroying her living room, and it wasn’t really set up for convenient fort construction anyway. I made up for that my junior year of college though. My roommate and I decided one long weekend that we needed a blanket fort movie night. We didn’t even need to rearrange furniture too much to make it happen. Our living room was really open, so we just placed a stool in the middle of the room to use as an anchor and then stretched blankets to all four corners. Last year, my roommate and I were part of a Spoken Word Project for MLK Day. It was organized mostly by Warner Pacific University, and was supposed to be people from a bunch of schools, but ended up being my roommate and I (from Concordia University-Portland) and a couple of Warner Pac students. We each wrote a section of the poem, and then performed the entire piece at the MLK Day Service Rally, where a bunch (over 10, I know, not sure of the exact number though) of colleges got together and got pumped up before we went out and did a bunch of service projects. It was the second or third year of the project, and I’m pretty sure they’re doing it again this year. The poetry performance was new, something to add to the rally. Here’s my section of the piece; I figured it’s appropriate because of the day. We wrote the poems in response to Dr King’s “The Purpose of Education” and the “I have a Dream” speech. Of course, it was written to be spoken, not read, but I think it translates decently to the screen. So enjoy; I hope it makes you think. Leave any reactions you have below! Dr. King spoke of being written a bad check. and sometimes, the system gets away with it. For all people have the right to learn.